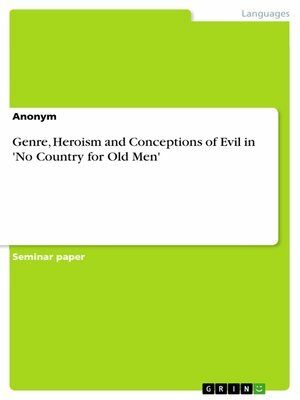 Seminar paper from the year 2009 in the subject English - Literature, Works, grade: 1,7, University of Freiburg, course: Novel / Film Adaptation, language: English, abstract: There is no need to explain that No Country for Old Men, published in 2005 by Cormac McCarthy – as well as the eponymous movie by the Coen brothers (2007) - are extravagant works in terms of style as well as in their philosophical conceptions. Since both were only recently released there is still very few secondary literature on the complexity of McCarthy's ideas and concepts of human – or mainly American – culture. Yet they have aroused a good deal of discussions and diverse receptions not only in literary circles but also (and this is mainly for the movie) within the public. Not only that McCarthy plays with different genres in one work, confusing the readers expectations and habitual ways of reading in general, but he also seems to deconstruct everything we thought to believe about society, morality, rules of living and fate. With Anton Chigurh McCarthy introduces a totally unknown, a new type of character, who finally makes all attempts of moral or philosophical interpretations fade with the wind, just walking down the road – alive.